Android L Battery Life Proves to be the Unsung Feature! Learning how each phone component uses power, Android L has evidently improved battery life to as high as 36 whopping per cent! While we focused on how Google’s biggest mobile OS change will provide us better design, performance, and a feature-rich experience, Google did something even better: considerably better battery life. 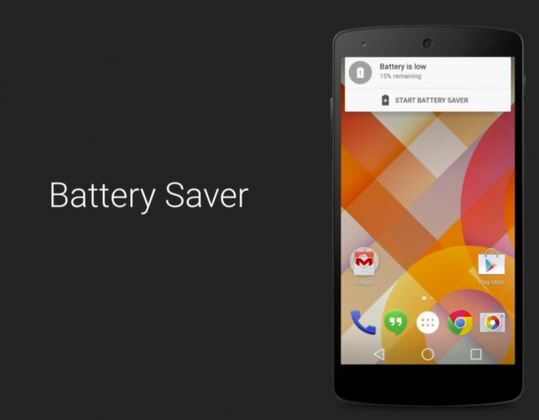 Here is how Android L could successfully manage to almost revolutionize smartphone battery life as we experience it. Every second of active smartphone usage reduces standby time by two minutes. Crazy, isn’t it? Thanks to Google’s Project Volta, we will experience a surprisingly better battery life in the next gen Android devices as it optimizes the power consumption by each component. Google in this year’s Google I/O conference at San Fran showcased that developer tools will help devs create more battery-efficient apps ultimately creating an entire ecosystem on the basis of a better knowledge of phone components and their energy usage leading to improved Android L battery life. The major highlight of Android L on the machine level was the switch from Dalvik to ART. With ART being a faster and more efficient virtual machine than the former, OS will be able to compile apps at once instead of every time they are run. This essentially contributes to less power usage and processing time. Thanks to Ars Technica’s latest tests, we can see how Google has actually achieved, or is trying to achieve, better Android L battery life. As the test shows that Android L has a new JobScheduler API allowing OS to batch up unimportant app requests which could be delayed to when the device is plugged in. Requests like database cleanup and log uploading, the tasks that can afford to wait, can be sent to be performed later by the developers. Another major battery drain occurs due to phone trying to connect to network. Now, Android L OS will not wake up the device to perform a network task when there is no network connectivity, as one wake-up second equals to -2 minutes of standby life. As data is the god these days, Google also took help from visualizing how power was consumed by different phone components to achieve better results. Battery Historian, an improved battery stat tracker, was created to have more power-tracking capabilities to visualize data and tweak OS for better Android L battery life. You can read Ars Technica’s findings over this link for more details. We surely are excited about such an amazing boost in battery life. However, we will have to wait until Android L is publicly released to see how things go off the Developer Preview version.